If someone were to ask me "what is the first food that comes to mind when you think of football", my answer without hesitation would be BUFFALO CHICKEN WINGS. They just go with football like peanut butter and jelly. Wings, a basket of fries and beer - doesn't exactly scream "healthy choices", right? While wings are great, I wanted to shake things up a bit and create a healthy alternative to the Gametime food we know and love. Why not combine buffalo chicken AND nachos?! These nachos have all the flavor elements you'd have with wings and a basket of fries...just in nacho form. 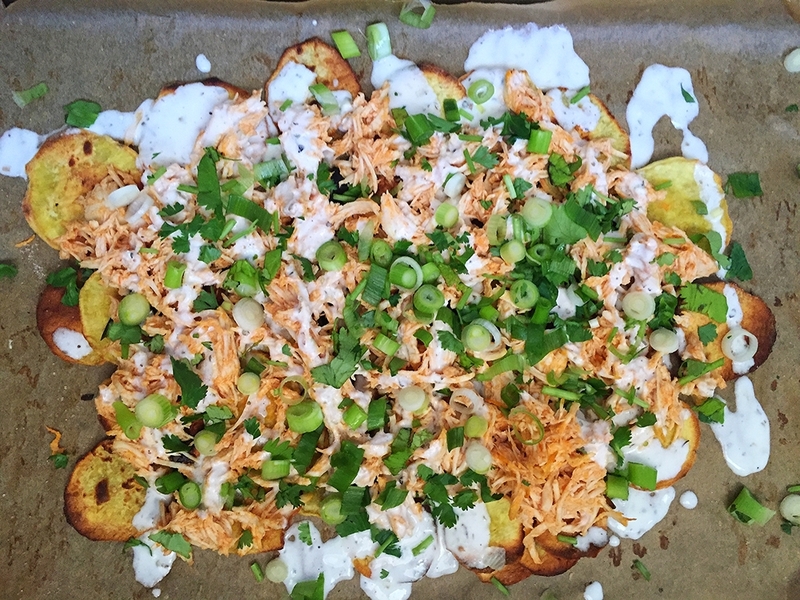 I'm using my Perfectly Baked Sweet Potato Chips as the base to this nacho creation. Because they are so crisp and perfectly baked, they stand up to the test of acting as nachos. Next, they are topped with shredded chicken that I've slow cooked with Frank's Hot Sauce (yes, 2 ingredients - does it get any easier?) and a goat cheese ranch dressing that is bomb dot com. Start by making the Buffalo Chicken. Place chicken breasts in crock pot and coat with buffalo hot sauce. Allow to cook on HIGH for 4 hours. During the last hour of the chicken cooking, prepare your sweet potato chips by following the instructions in my previous post. Also while the chicken is cooking, prepare the goat cheese ranch dressing. In a bowl, combine all ingredients and mix until a creamy dressing consistency is reached. I recommend to start by adding only 2 tbsp of milk. Check consistency - if it is too thick add more milk, tbsp by tbsp, until your desired consistency is met. 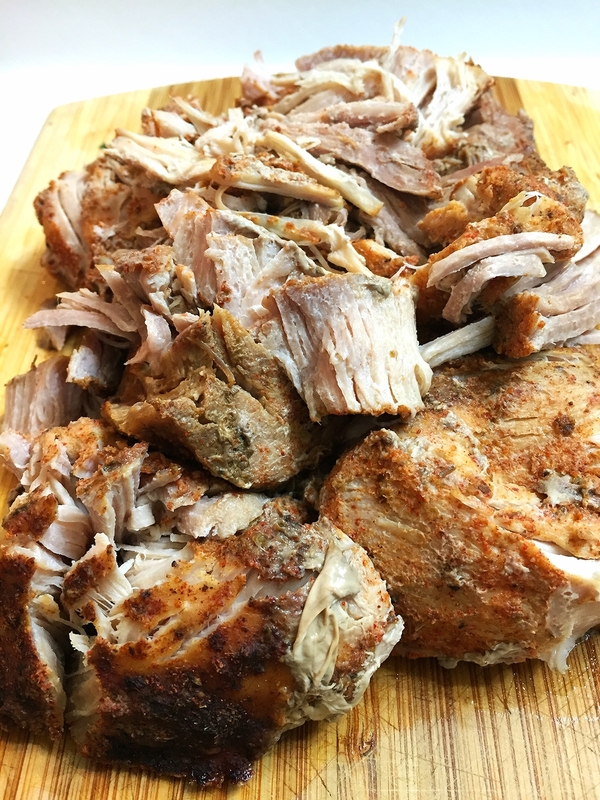 Once chicken has cooked, shred chicken with forks within the crockpot. Mix chicken with the sauce within the crockpot - we don't want to drain this! To assemble, on a parchment lined baking sheet arrange sweet potato chips. Top with 1 cup of shredded chicken. Next, drizzle ranch dressing over chicken and finish with scallions and cilantro. Posted on October 9, 2015 by Megan Gunther and filed under Recipes, Chicken and tagged Nachos Football Buffalo Chicken Chicken.